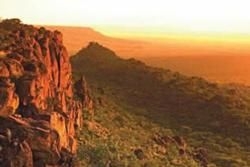 The Waterberg Plateau National Park was proclaimed in 1972 in an effort to safeguard wildlife populations from poachers. Stretching over 41,000 hectares the plateau houses some of Namibia’s rare and endangered species such as black and white rhino, sable antelope and blue wildebeest as well as those found in abundance. The Waterberg is also a very important historical site as it was here that the indigenous Herero forces lost their last stand against the imperial German forces in 1904. It is estimated that two thirds of the Herero population was lost, the rest found refuge in neighboring Botswana (the then Bechuanaland). The programs of conservation and rehabilitation are widely successful today with the National Park able to supply other approved areas in Namibia with various species of game, the successful reintroduction of black rhino to the Damaraland area in 1989 being a sure highlight. The rest camp offers guests a wide variety of accommodation types, from camping to luxury rooms. A restaurant and shop adds an extra touch with a beautiful outside relaxation area and swimming pool. There are various routes for hikers up the sides of the mountain and the view from above is truly spectacular. Game drives on the plateau are rewarding and incredible. With over 200 bird species, among them Namibia’s only breeding population of Cape vulture, the Waterberg is rich in natural heritage. The conspicuous blue silhouette of the mountains is not to be missed when traveling north along the main road towards Otjiwarongo.